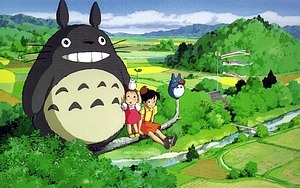 Miyazaki's name and his animation house Studio Ghibli have become synonymous with Japanese animation. "He's a wonderfully creative storyteller who has somehow found a way to tell the stories that he wants, and that puts him in an incredibly small bracket of writer-directors worldwide," says Jonathan Clements, co-author of The Anime Encyclopedia. "All the smaller in that his works are also blockbuster successes." Princess Mononoke, an ecological fable set in Japan's distant past, was the country's top-grossing movie until Titanic eclipsed it in 1997; Miyazaki reclaimed the title in 2001 with the Oscar-winning Spirited Away—the tale of a 10-year-old's quest to deliver her parents from a spell that has turned them into pigs. Like many of Miyazaki's films it's a rumination on the importance of self-reliance, selflessness and the challenge of growing up. This thematic richness is key, says Studio Ghibli producer Toshio Suzuki: "Our films are the result of serious and earnest consideration of what kind of films should be made for children." What makes Miyazaki's movies all the more remarkable is that in an era when each computer-animated feature from the likes of Pixar and Disney is more kinetic than the last—Cars! Toys! Fish!—he continues to handcraft a world of Zen-like stillness and beauty: water dripping on mossy rocks, or a train gliding over the sea in twilight. The dramatic punch is delivered not with a showstopping musical number or high-tech wizardry but with simple, stunning imagery that still takes your breath away.